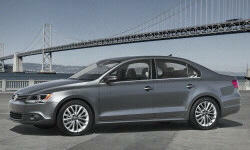 Why the 2011 Volkswagen Jetta? Gorgeous, with Audi-like lines that are especially attractive in the rear 3/4 view. The car looks like a far more expensive vehicle, and is not at all out-of-place parked next to my Mercedes. While rated at only 32 MPG highway, I drove the Jetta roundtrip from Bakersfield, CA to Las Vegas, NV (300 miles each way, over 3 mountain passes) and the car returned 37 MPG at a cruising speed of 80 MPH. With automatic transmission and full power accessories (except for cruise, which was not available on 2011 S model) this car cost only $17,000. While not particularly powerful, it in no way looks or feels like a cheap car. The ride is smooth and quiet and the car is very large inside, but somehow still handles like a much smaller and sportier car. Even the base model is fun-to-drive, with well-controlled ride motions. A great road-trip car. The engine is very old-tech and has only 115 HP, however the 6 speed auto is thoroughly modern and makes the most of the low power and average torque. Acceleration is mediocre (0-60 11 sec), but totally adequate. Smooth and quiet beyond its price. Why Not the 2011 Volkswagen Jetta? This is NOT a fast car. If you value rapid acceleration, look elsewhere. That said, its not as bad as most reviewers say it is. No armrest or cruise control on the base model. Cruise is understandable at the price, but an armrest? Come on VW. While the Jetta is extremely roomy and comfortable, the center console is slightly too close and can interfere with the driver's right knee and calf. There is no temperature gauge.